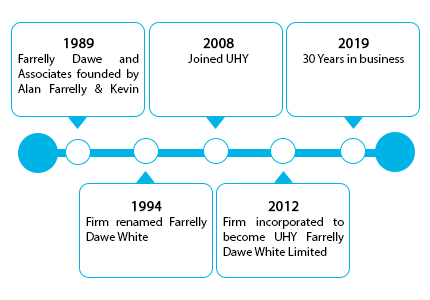 UHY Farrelly Dawe White are a solutions-focused, Director Led, full service practice and are proud to provide a first-class, attentive and personal service to all of our clients; from the large corporates to the individual owner-managed or family-run businesses. How are UHY FDW different ? We have a real interest in helping you and your business succeed. Our managers are always available to answer your queries. We are your business advisers, not just your accountants. We can assist your businesses growth at both national and international levels. We are a one stop shop as a regional practice, offering a wide range of professional services. Our people are friendly, dynamic and always eager to assist and support your business needs. Our clients come in all shapes and sizes and so do our services. Whether your concerns are basic or complex, or your reach is local, national or international, we provide relevant and immediate solutions. We will tailor our services to meet your needs; because ultimately we are focused primarily on adding value to our clients. We work to ensure the process is as simple, effective and hassle free as possible with a client focused and partner led approach to the services we provide as we recognise our clients’ constraints of time, team and resources. We identify the challenges and problems you have and more particularly we recommend actions and solutions that will drive better results. We ensure Best Advice, Better Results, every time. Find out more about our technical skills and industry capabilities.